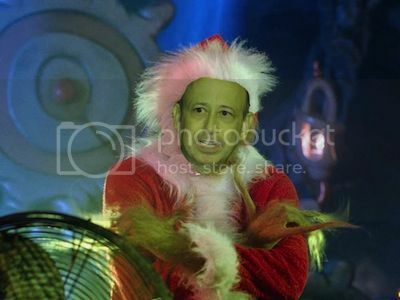 Lloyd Blankfein, Ebenezer Scrooge Impersonator, says, Bah Humbug to the Middle Class! The hypocrisy of Lloyd Blankfein, a Wall Street banker, and other corporate leaders who have inserted themselves into the debate over major tax and spending decisions under consideration in Congress is nothing short of repugnant. Blankfein's Goldman Sachs got billions from the federal government during the Wall Street bailouts, enabling him to hold a job that paid him $16.1 million in 2011, and now he wants the rest of us to take a pay cut -- now and in the future. Referring to Social Security, he told CBS, "You're going to have to do something, undoubtedly, to lower people's expectations of what they're going to get." That's a second-rate vision for a first world country, and we just voted for a lot better than that. Blankfein is one of many Fortune 500 CEOs who joined together under the name "Fix the Debt," a campaign to cut Social Security, Medicare and Medicaid to address the federal deficit during the fiscal showdown. This group of more than 90 CEOs is pushing cuts to middle-class programs while shielding millionaires, billionaires and big corporations from tax increases. Each of these executives has amassed retirement assets averaging more than $9.1 million, according to a report released today by the Institute of Policy Studies (IPS). Of the more than 90 CEOs involved in Fix the Debt, 41 run companies with pension programs, but only two of those plans are fully funded, IPS said. It's the second impressive IPS report in the last week, and it lays bare the flagrant hypocrisy of these captains of finance and industry.